For about two years I was suffering from an old MP3 player. It was too big and too small. Too big in dimensions and too small in capacity. At least thats why I almost never used it. But sometimes mobile music is a nice thing to have so I looked for an adequate music player. Sure, iPods look very nice and even the laser engraving is a neat thing. But iPods lack one very important feature: they can’t play Ogg Vorbis. Sorry Apple, I asked you for Ogg Vorbis support in iPods over two years ago when I got my first MacMini (PowerPC). Yes, I had one as my Workstation for 2.5 years, as we ship openSUSE for PPC again since 2005. Finally after reading lots of reviews I found the Cowon iAudio 7 and liked it. 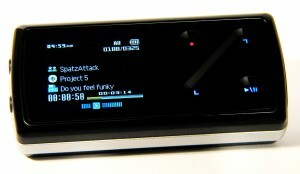 Its lightweight (35g), big (16GB), plays Ogg Vorbis, flac, wav and MP3 and even has an integrated FM radio. Additionally it can play videos, which I can’t think of ever needing it on a 1.3 inch display (videos need to be recoded on the PC anyway) and it has a built in microphone and a line input, so it can record from these and from the radio. But I wont use these features either as I have a more suitable device for mobile recording (maybe I’ll blog about it as well). The navigation on the iAudio 7 is done with the “Swing Touch” and an additional menu button on the top. This was odd just for the first minute but then I loved it. Once I got used to it I could jump to any function intuitively. Together with in-ear head phones from AKG I now use the iAudio 7 on my trips with the public transport on my ways trough the city. Btw. the music the player is playing while taking the photo can be found at jamendo.com.